This healthy and easy to make chicken dish is perfect for iftar..Moroccan food is lovely; it’s pleasant, subtle and tasty. 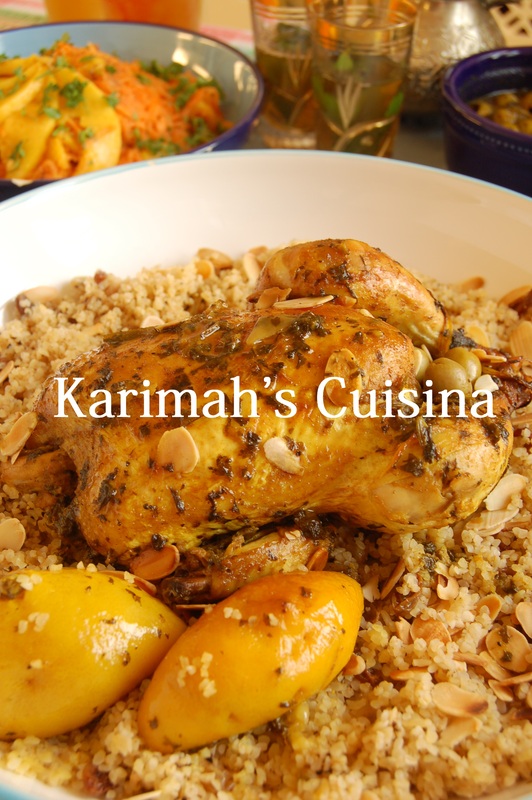 You don’t have to be Morrocan to cook great Morrocan food…its so easy. From the book, “Heavenly Bites, the best of muslim home cooking” from Amazon or Kube Publishers. When I first became a Muslim, my local masjid was in a Moroccan area so all my new sisters were Moroccan. Moroccans are very hospitable people and so they invited me to their houses to eat and find out where I had come from, be careful don’t give all your secrets away This chicken dish is sometimes served at weddings as one of the courses but would be great as a weekend roast, my mouth is watering just thinking about it. You can also use this marinade on chicken wings and in the same way leave to marinade over night. Then can be roasted, grilled or BBQ. 2. Place in food processor saffron, ginger, black pepper, cumin, salt and lemon peel. (Grated with fine side of cheese grater), lemon juice, olive oil, roughly chopped coriander and parsley. 3. Use blade fitting in processor to cut mixture fine so that end result looks like coarse puree or pound in mortar and pestle. 5. Ideally leave to marinate for a few hours covered with cling film in fridge or even over night. 6. Place is baking dish that is not tight and the chicken needs space for the hot air to move around. Cover with tin foil and place in pre-heated over gas mark 7, 425 Fahrenheit and 220 C for 30 minutes. 7. take out of oven and add olives, slice preserved lemons and place on skin, and if the chicken has made any juice carefully spoon over the chicken, if not you may want to add a little more vegetable oil on the chicken and put back in oven for another hour, still covered with foil, then take the chicken in the baking fish out of the oven. 9. Take the chicken out of the oven and serve in large bowl or plate, pour some of the gravy over the chicken. Traditionally Moroccan chicken is eaten with bread but some of us don’t like white bread because it’s not really that nutritious for a change it’s really nice with Caribbean rice and peas but that another recipe! Some salads would be great like salsa chebolla or Moroccan orange and carrot salad…Thank Allah and enjoy! Food is a blessing from Allah so be grateful to the Creator! hi I received your recipe. They are very nice. I’m to try it in Ramadan. Send me more recipes!